This small quilt was designed by Maryann Scott-Smith of Bayberry Quilt and Gift Shoppe. 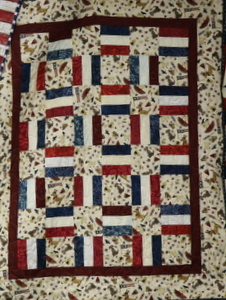 This quilt has an Americana feel. It is made using a new novelty fabric with a summer theme. A great beginner project or a quick-do project to make in the summer heat. Quilt measures 38″ x 47″. This can be your 4 week summer class project. Limited kits available.